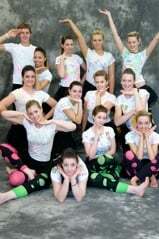 We offer just for fun classes in Hip Hop and jazz. These are no pressure classes where the students can learn to dance without the commitment to perform. This is a great class for beginners or late staters. All new students over 7 years without prior dance training are advised to do at least one year in these classes before progressing to the performance teams.